Hi friends I am recently make up my mind to install windows 7 in my desktop but I am bit confused what is the difference between in all the versions of windows 7 editions like ultimate, premium and professional, and which is the best version to install in my desktop? Re: What is difference between windows 7 ultimate, premium and professional? 1. home premium cannot run existing windows xp productivity applications in windows XP mode, but other two can do it. 2. home premium cannot connect to company networks easily and more securely with domain join, others can do. 3. ultimate will help protect your data on your PC and portable storage devices against loss or theft. 4. ultimate will work in the language of your choice and switch between any of the 35 languages. Windows 7 Home Premium worth the trouble I think probably not. 1. Windows 7 Home Premium has the recovery drive first met in Windows Vista. 2. Windows 7 Ultimate does not. Unfortunately detailed information on windows 7 versions differences is not available. So Being just a tad suspicious and extremely paranoid. Windows 7 versions will be different as like professional,home premium and also ultimate.So with these versions of windows 7 the user can choose any one from them but the difference between them is only making 32 bit or 64 bit of windows and also options of the windows so with these considerations we can make our windows 7 os much better than any other. window 7 ultimate has many facility like gadgets and persnaliz. window 7 premium has many useful facility like multimoniter and connect to ur mobile. window 7 professinal has many more useful facility like u can opret ur mobile and other computer with it . 3. Window 7 Professional : It has also the recovery drive and many more facilities and the application which are use ful for the computer professional. Ultimate Edition is of high cost compared to Professional Edition. Ultimate Edition has BitLocker, but not with Professional. Ultimate Connect Office Networks Securely, but not done with Premium. Ultimate Edition has AppLocker but not present with Professional. Ultimate Edition has VDI and MUI Languages but not present with the Premium and Professional. The features are more when you come down the list and so the prices. For delvelopers professional and ultimate is used. For simple users either home premium or home basic is used. Now you are searching for difference between windows 7 ultimate, premium and professional, then you don't worry the information regarding this and the main difference is upgrade options in stalling process and below is the chart that shows you the difference between windows 7 ultimate, premium and professional..
++ bit locker is not present in window home premier and window ultimate it is only present in window 7 professional. ++ window 7 professional has 35 languages which are not in other windows. ++ for more details see attachment there you get full details. 1. Home Premium can't run existing windows XP productivity applications in Windows XP mode, but other two can do it. 2. Home premium can not connect to company network easily and more securely with domain as other can. 3. Ultimate can support much flexibility between the languages. It can switch up between 35 languages. 4. Ultimate helps to protect the data stored in your personal Computer. Some difference is there in that windows 7 Ultimate and Premium and Professional..
--.Ultimate is fully vertion to comparing the premium version to that windows XP some options are increse in comparing that version..
--Highly compatible not asked Geniue or not because of using the "Crack" in that compatibility..
--windows 7 professional is a Primitive drive..
--ultimate version is primitive but not a professional version..
--Home premium is attraction vertion to recovery in that data and some ultimate options are there..
dd.jpg this is windows 7 Ultimate version..
ddddd.jpg difference of these versions..
differencebetweenwindows7homepremiumprofessionalandultimate-thumb.jpg Difference to rating and is it correct os or not to decrease including that chart..
1: Windows 7 Home Premium has the recovery drive first met in Windows Vista. 2: Windows 7 Ultimate does not. @ HOC WIRELESS NETWORK AVILABLE IN WINDOW 7 HOME BASIC. All versions of Windows 7 are good. They have been categorized in Ultimate, Premium, Professional, Basic, Enterprise, etc. The difference between these versions is related with their features. More features in Windows version, means that its price will greater than other versions. However, Windows Ultimate has maximum features that's why it has the maximum price of about Rs.13000. Likewise, the versions like Home Basic and Home Premium has less features so their price is low in comparison to Ultimate. windows 7 ultimate , premium and professional are having some differences. windows 7 ultimate is having additional features than the others. such as bitlocker for encryption and personaliztion menu in desktop which supports themes option and additional languages option. the other versions will not have these options. " WINDOWS 7 ULTIMATE " is top among of all of the remaining because it is having all features. Microsoft recently announced Windows 7 pricing and upgrade options. Now that we have Windows 7 pricing and upgrade matrix, let’s check the difference between the most wanted Windows 7 editions: Windows 7 home premium, Windows 7 Professional and Windows 7 Ultimate. Since Windows 7 upgrade program and Windows7 pre-order program started already, you might want to check the suitable Windows 7 edition for you. 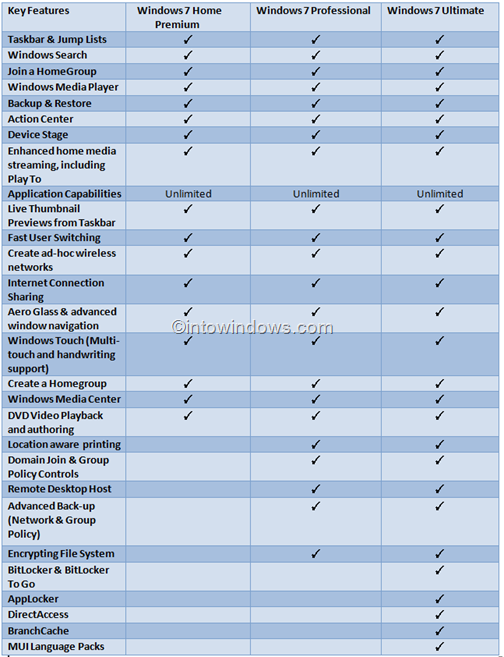 Below is the chart that shows you the difference btw Windows Home premium, Professional, and Ultimate editions. The Difference between Windows 7 Ultimate , Premium and Professional is as follows. Premium : It has main attraction of the recovery drive which is introduced first in any operating system. Ultimate : It has many facilities of using gadgets and Personalizing. It has No Recovery drive. Professional : I has the recovery drive and many other features which are helpful to the Computer professional. These are the basic differences. Windows seven Home Premium definitely worth the hassle i believe most likely not. Windows seven Home Premium has the recovery drive 1st met in Windows prospect. sadly careful info on windows seven versions variations isn't obtainable. therefore Being simply a shade suspicious and intensely paranoid. Windows seven versions are completely different as like skilled,home premium and conjointly final.So with these versions of windows seven the user will select anybody from them however the distinction between them is merely creating thirty two bit or sixty four little bit of windows and conjointly choices of the windows therefore with these concerns we are able to create our windows seven os far better than the other. Ultimate Edition is of high value compared to skilled Edition. Ultimate Edition has BitLocker, however not with skilled. Ultimate Connect workplace Networks firmly, however not through with Premium. Ultimate Edition has AppLocker however not gift with skilled. Ultimate Edition has VDI and MUI Languages however not gift with the Premium and skilled. * Premium and Professional users will be able to upgrade into Ultimatefor a free using windows anytime upgrade. * Supports Aero features as like Aero 3D, Aero shark etc. * It can be used at every field. * Best choice for Business users. * Holds the Desktop Gadgets.